Pound meat thin and sauté in vinegar over medium heat 2-3 minutes on each side until vinegar evaporates and a brown glaze starts to form. Add a little water or wine to “De-glaze” pan to form a small amount of gravy. After sautéing meat, poultry or vegetables, there is always a brown glaze stuck to the bottom of a pan. This glaze is pure flavor! To capture it, just add 4 tbl. of Herbally Yours Vinegar and ¼ cup of water or wine to the empty pan. Simmer on low for a few seconds until liquid reduced to ½ while scraping pan bottom. This is called “De-glazing” a pan. Now serve your secret “gravy” over meats or vegetables. Mix any of Herbally Yours Dried Herbal Blends (About 2 TBL) with a stick of softened butter to be used as a tasty spread for bread and crackers or as a basting sauce for meats and vegetables. Freeze and serve during the winter months! Use Herbally Yours Vinegar straight from the bottle (a little goes a long way) for a no-fat dressing or add 1 part Herbally Yours Vinegar to 2 parts oil. Add herbs and spices to taste. 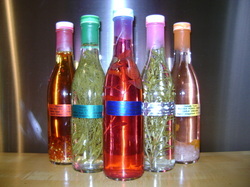 Vinegar has been used for centuries to tenderize meat. Rub ½ cup of Herbally Yours Vinegar on any cut of meat. Wrap and refrigerate for up to 24 hours.